Complete with gin on the basket. Wicked. The blogger du jour in Denmark is called Copenhipster. He mocks and teases the hipster/jetset/wannabe scene with sharp wit and clever irony. He went for a bicycle ride with his friends and the pictures are worthy of Cycle Chic - albeit Tongue in Cheek Cycle Chic, but hey. As he writes in the blog post, "High on gin, perfect selv-orchestration and pent up energy we flew across the summer landscape on our two-wheeled lovers." Insert all the irony you want in that line, but it's still lovely to read. 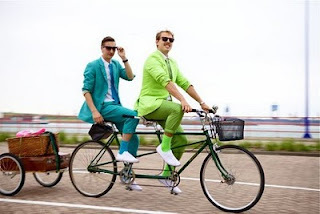 "Style conscious cyclists! Match your socks to your handlebars!" Check out the rest of the photos (and text if you do Danish) on Copenhipster's blog. 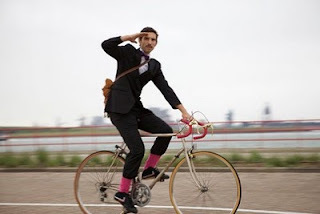 Sorry, but a real hipster has to ride a fixed gear. I like the top picture very much ! 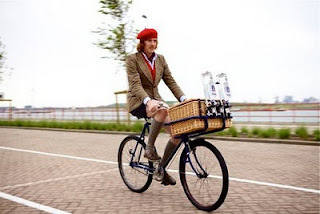 "Sorry, but a real hipster has to ride a fixed gear." Ha! You'd better tell that to the next wave of hipsters who are riding vintage 5-10 speed racers, since the world and their dog cottoned onto the fixie craze. You can't stand still, you know. Fashion moves. An admirable combination of whimsey and panache. indeed. fixies are no longer hip. vintage racing bicycles are the thing.